I just sprained my Geek-O-Meter. A lot of people have been complaining about the look of the armor and stuff, but I myself love it. I think it fits nicely with Marvel Movie Universe that they have created. i cannot wait for this movie, or the Captain America and the Avengers movies for that matter. I demand hats on all Asgardians! Seems to me whoever designed their outfits was trying to tap into Jack Kirby more than the Norse myths. With that in mind, I dig it, even though I miss their helmets. I gotta agree with TopHat on his comment. It ain’t Thor or Loki without their helmets. Odin is iffy imo but we needs our helmets!!! It’s like a sandwich without Miracle Whip! Loki looks way too serious. But I’m going by myth, not comic, so in all fairness he could be perfect for the character. I just always liked Loki. He was problematic, but so damn gleeful. Excellent point that this is a) definitely an homage to Kirby, which I am all for, and b) it ain’t Kirby without the awesome helmets. On the other hand, there is no way in Hel you could make that giant Kirby longhorn gold helmet Loki sports function in real life. So there’s that. And as always, Hollywood hates the idea of their leading man running around in anything that obscures that million dollar face. So I understand why they’re leaving the helmets off, but now that it’s been pointed out I am having trouble getting over it. Kirby needs outrageous headgear, dammit! 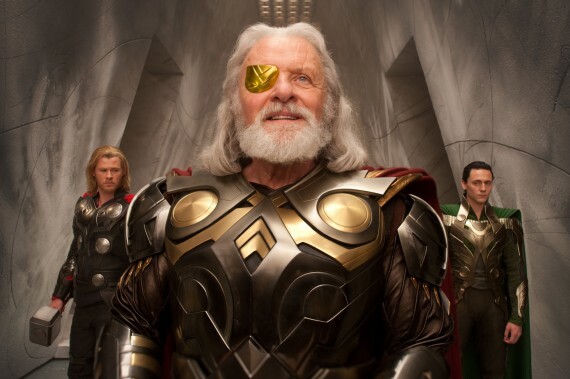 What’s bothering me is the color of Odin’s eyepatch. It seems to me it should match one (or both) of the metals that’s already in his armor. As for hats, maybe they reserve them for outdoors, like polite cowboys do. But I confess I won’t mind if they’re gone, as Thor’s little winged skullcap never did much for me and Loki’s helm would be tough to get through doorways. I myself am very strict when it comes to mythology and the armors aren’t what i expected but they fit perfectly in with the marvel universe.And when you think about it ,they’re gods and they’re armor should be unrealistic ,godlike and flashy.So i’m 110% thumbs up on the armor.About the helmets ,Thor i never really liked it but it’s not the same without it and Loki’s i personally love it but can’t see it working out in a real life movie ,maybe if they shorten the horns but keep the overall look ,maybe it would work. I’m with you on the eyepatch, X-stacy. Partly it’s the color and partly it’s just so shiny. It screams “Excalibur” the movie to me. I didn’t realise that Norse gods liked Art-deco armour. They are from an unearthly realm so I supose it’s OK.
To me they don’t look “hard arse” enough. Guess the Norse Deities realy enjoy their Hollwood manicures. I agree with Mr Vampire. The Norse gods, to me at least, should seem a little less foppish or tecky. Don’t get me wrong, I’ll still go see the movie and likely enjoy it, but I would prefer more fur and caps for certain. Remember, too, that in the Marvel Universe, the Norse Gods are still sort of on the fence whether they’re actually GODS or extraterrestrial/extra-planar beings with godlike abilities and powers who were worshiped as gods. With that in mind, there’s no reason their armor should not evolve with the passage of time, and as they come in contact with other cultures and are influenced by them. That having been said, though, I’d really like to have seen some Nordic style knotwork at least on Odin and Thor’s armors. These dudes don’t look like Norsemen. That doesn’t look like the magnificent Valhalla. And ol’ Lecter looks like he’s peeking up Freya’s gilded skirt. The dude from “Adventures in Babysitting” looked better. Yes knotwork; needs more knotwork! You have to give them a pass on not looking Norse; Marvel’s Asgardians have never looked anything like actual old Norsemen. The only one they had that looked Norse was when they did the “Red Norvell Thor” arc back in the ’80s. my opinion is that both Odin and Loki should stick with the traditional Norse armor, they are the gods after all. for the most part they just really chill in Asgard, or attacking Asgard, so they should really stick with the more traditional battle-worn and ugly Norse armor. Thor’s armor i like. he is the hero after all, so he should move with the times. im surprised noone mentioned thhis but you also have to realize that the makers of the movie had to make the characters and everything much more realistic and its kinda hard to connect the mystical realm of Asgard and the real world in a way people would understand. i think that they did a fantastic job on iron man 1 and 2 and the incredible hulk , so im not too worried aboout this one. i ,so far, like the look of the armor, but i agree that the eyepatch just doesnt seem to belong. it almost looks photoshopped on, what with the slightly off color and shinyness. i am also very much missing thor’s helm. that was an iconic piece of the character. We’ll see. I’m actually digging the set more than the costumes.